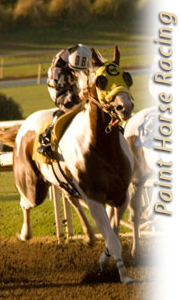 Inside Paint Horse Racing- If you love the sound of hooves thundering down the track, Paint Horse Racing brings the color, speed and thrill of Paint racing to your fingertips. Published six times a year, Paint Horse Racing, delivers the full story on champion Paint racehorses, current racing industry news, up-to-date leading lists, upcoming barrel races and more. Advertise- Paint Horse Racing offers an array of advertising options that can be customized to fit your budget and needs. Check out the options and get your business on the track to success. Racing Marketplace- The Marketplace offers a full array of horses, services and other items available to you on-line. Marketplace listings also appear in the Paint Horse Racing.